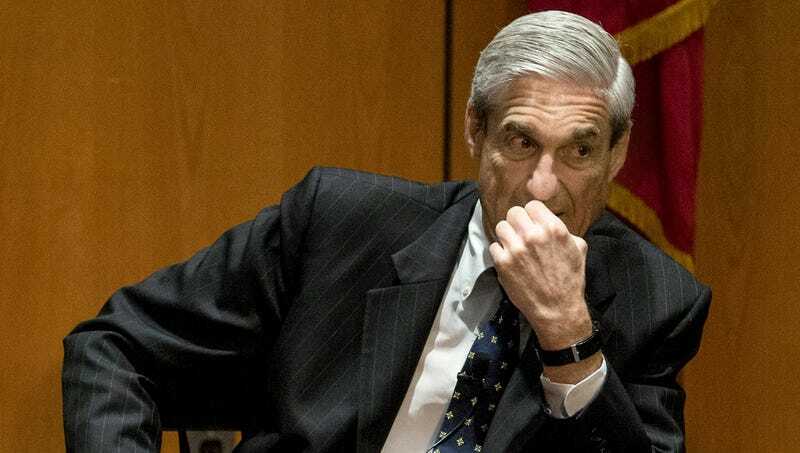 WASHINGTON—Realizing this thing might go a whole lot higher than anyone had imagined, Justice Department special counsel Robert Mueller reportedly grew pale Tuesday, the blood draining from his face, as he discovered his Russia investigation might lead all the way to the White House. “No, no, no, that can’t be right, because if that’s right, then we’re dealing with someone who could, at this very moment, be sitting in the Oval Office,” a trembling Mueller said as he grabbed an evidence folder from his desk and began to tack up photos of campaign associates, Russian oligarchs, and others accused of interference in the 2016 election, stopping to draw a large question mark on the only individual who could connect them all. “Dear God. I knew I was on to something big, but I didn’t know it was this big. Everyone on my team, all my prosecutors—I just hope I can trust them. Because this case points to one place, and one place only: The very top.” At press time, sources confirmed the former FBI director had looked out the window at the White House, drawn the blinds, searched his office for listening devices, and vomited into a trash can.